CMIP model data are made freely available to the public and the scientific community in the belief that their wide dissemination will lead to greater understanding and new scientific insights. The data are published and freely available on the Earth System Grid (ESGF: https://esgf-node.llnl.gov/projects/cmip6/ ). The Earth System Modelling community makes the following fair use request to ensure that scientists receive fair credit for their work. Data can be freely used in analyses, but in the event of this leading to publication in a journal users are requested to consider if co-authorship from model groups may be appropriate. If the CMIP data are essential to the work, or if an important result or conclusion depends on them, users are encouraged to contact model group representatives and invite possible involvement in any resulting publications. This fair-use request is not intended to be restrictive, but rather to encourage inclusivity and provide a mechanism for scientists to receive due credit for many years of effort building and configuring complex modelling systems. The historical carbon isotope forcing datasets are described in a GMD paper (Graven et al. 2017) and they are available as a supplement to the paper, as well as through input4mips. 1) Total anthropogenic CO2 emissions consist of the sum of all sectors in the "em-anthro" file plus 3-d emissions in the aircraft CO2 emissions file. There are, therefore, two CO2 emissions files for each scenario. Use a sum of them as total emissions to force emission-driven experiments! 2) We found out that cumulative CMIP6 emissions are higher than the Global Carbon Project emissions by ca. 10 PgC, mainly in the period 1950-1999 (see the Table below). An explanation from Steve Smith: "CEDS produces CO2 emissions consistent with all the other species. So while we build on CDIAC assumptions, it is a different methodology because CEDS is fundamentally sector, not fuel, based and results in a somewhat different total." 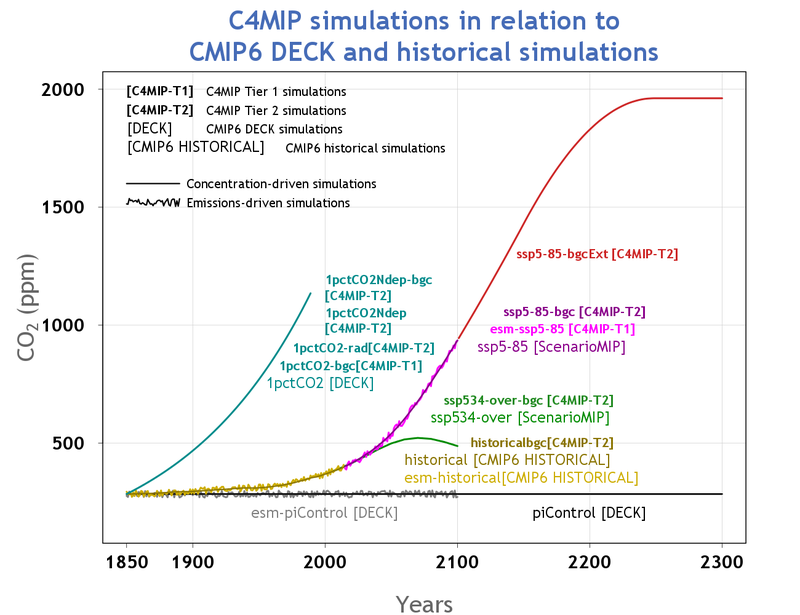 For any other emissions-driven scenario runs you wish to perform outside C4MIP, the same procedure can be followed to scale 2014 patterns by the scenario global total. Figure 1 from Jones et al 2016, click image to enlarge.